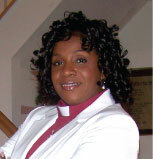 Dr. Gwendolyn Denise Pierce is a preacher, teacher and a motivational speaker. She is a native of Birmingham, Alabama where she attended public school. Dr. Pierce earned her doctorate at Wesley Theological Seminary concentrating in "Spirituality and Health in the Communities. She holds a Master of Divinity Degree from Howard University School of Divinity; Master of Fine Arts Degree from Howard University in Electronic Studio. She taught Computer Graphics as an intern at Howard University School of Fine Arts. A Bachelor of Arts Degree from Marymount University in Graphic Design with a minor in Communication Design with a Specializing in Advertising Design. Dr. Pierce also attended Ebenezer Bible Institute and Evangel Cathedral Bible School of Healing; She has resided in the Washington D.C. metropolitan area since 1986, after serving 15.5 years in the United States Army. Dr. Pierce preached her initial sermon at Royal Oak Pentecostal Church, Landover, Maryland, in 2004 and ordained as Elder at Faith Temple Church for all Nations, Pentecostal Deliverance Ministry in Washington, DC. Dr. Pierce presently serves as the Assistant to the Pastor at Petworth United Methodist Church and Van Buren United Methodist Church in Washington DC., Associate Pastor at Royal Oak Pentecostal Church in Landover, MD. Dr. Pierce has also served as an Intern Hospital Chaplain at the Washington Hospital Center in Washington DC, and is a present member of the Association of Professional Chaplains, Member of the American Psychotherapy Association (APA)Academy of Certified Master Chaplain ~ Level III Certified in Homeland Security~Level I (ABCHS) American Board for Certification in Homeland Security as a certified Chaplain. Dr. Pierce has held numerous positions of leadership, both inside and outside the church, including Bible Study, Conferencs (2007 "The Divine Connection Conference), (2008 - Divine Connection Conference: "Taking Back What the Enemy Has Stolen! "), 2009 - Mothers and Daughters Empowerment Summit, Daughters of Zion Conference, "Celebrating Restoration, Salvation with Determination," Seminar: How to Heal Your Mind, Body and Soul (Mentally, Physically, Spirtually, Emotionally, Sexually, and Financially In God's Divine Power by Detoxifying the Poverty Spirit of the Mind). Prison Ministry, and Pastoral Care/Counseling, and mentoring to the youth and young women of Christ. Dr. Gwendolyn is the founder and Executive Director of, "Matters of the Heart Outreach Ministries, Inc." and "P.R.A.Y.E.R. For The Youth: Christian Rites of Passage Paradigm" She is a self-published author of the book "Nothing But The Truth". and is now working on her second book, due to come out soon. Dr. Pierce also writes of a monthly electronic newsletter called "The Good News" - Discerning the Power of the Holy Spirit; Winning Souls to Christ". Dr. Pierce is the mother of two sons: Kireem and Karlos, and a proud grandmother of four: Diamond, Krystal, Kireem, Kartez, and Goddaughter Jada. Rev. Gwendolyn D. Pierce, M.Div.,D.Min., Director • P.R.A.Y.E.R. for the Youth, Inc.